Conservation on February 11, 2019 by Jana. 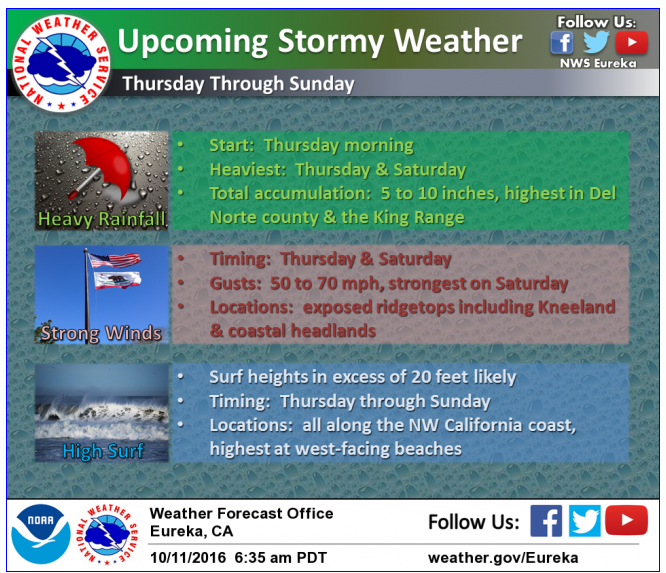 The North Fork of the Gualala River has increased consistently due to a series of storms that have hit our area over the last few weeks. River flows are now above the bypass requirement of 41 cubic feet per second (see here), which means that the district is back under Voluntary Water Conservation measures. Customers were notified of the change by automated phone calls today. 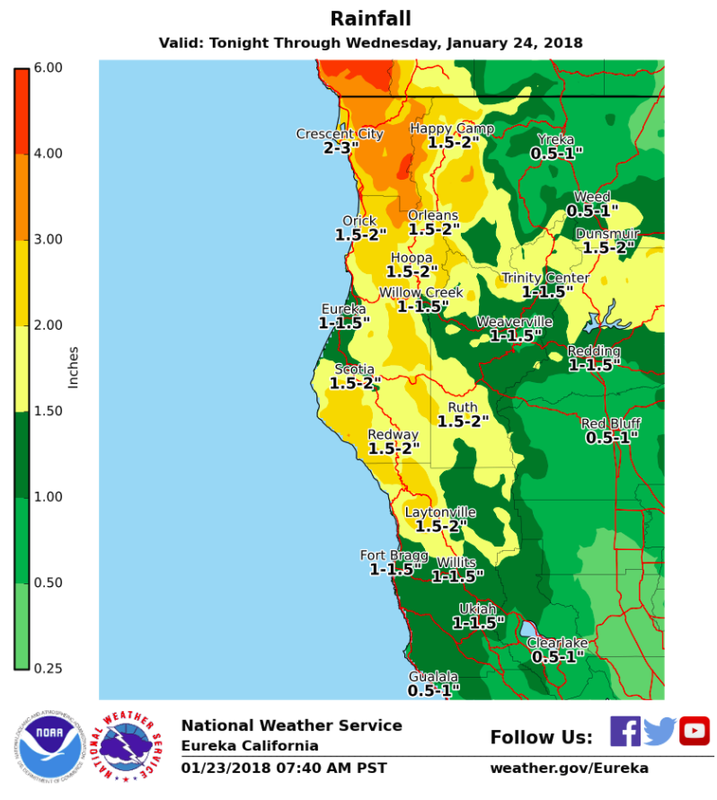 The National Weather Service has issued a Hazardous Weather Outlook and other weather outlets are showing predictions for several more inches of rain this week. Batten down the hatches everyone! And keep up the good work with your conservation efforts! Conservation, News and tagged Mandatory conservation on September 10, 2018 by admin. River flows have fallen below the required minimum, putting the Mandatory Water Conservation Program back in effect. Read all about it here. Customers are reminded that restrictions on water use are in place, including irrigation methods and timing. For details, please refer to the above Mandatory Conservation page and to the customer handout from your November 2014 bill, which can be found here. Please call the office if you have any questions. As always, thank you for conserving water! Conservation on February 23, 2018 by admin. Conservation on January 23, 2018 by admin. The North Fork of the Gualala River has increased due to the recent rain events. River flows are now above the bypass requirement of 41 cubic feet per second (see here), which means that the district is back under Voluntary Water Conservation measures. The rainy season is (finally) here! Thanks for your conservation efforts, everyone! Conservation, News on November 22, 2017 by admin. River flows are anticipated to drop below below the required minimum over the holiday office closure putting the Mandatory Water Conservation Program back in effect. Read all about it here. Conservation and tagged Voluntary conservation on October 11, 2016 by admin. The North Fork of the Gualala River has increased due to the recent rain event. River flows are now above the bypass requirement of 41 cubic feet per second (see here), which means that the district is back under Voluntary Water Conservation measures. Conservation, News and tagged Mandatory conservation on September 8, 2016 by admin. River flows have once again fallen back below the required minimum so the Mandatory Water Conservation Program is back in effect. Read all about it here. Customers are reminded that restrictions on water use are on place, including irrigation methods and timing. For details, please refer to the above Mandatory Conservation page and to the customer handout you received with your November 2014 bill. Conservation, News on March 4, 2016 by admin. On February 11, 2016 the California Public Utilities Commission adopted Resolution W-5082. This resolution extends the statewide water use restrictions previously imposed by the State under Resolution W-5041 to be effective through October 31, 2016. 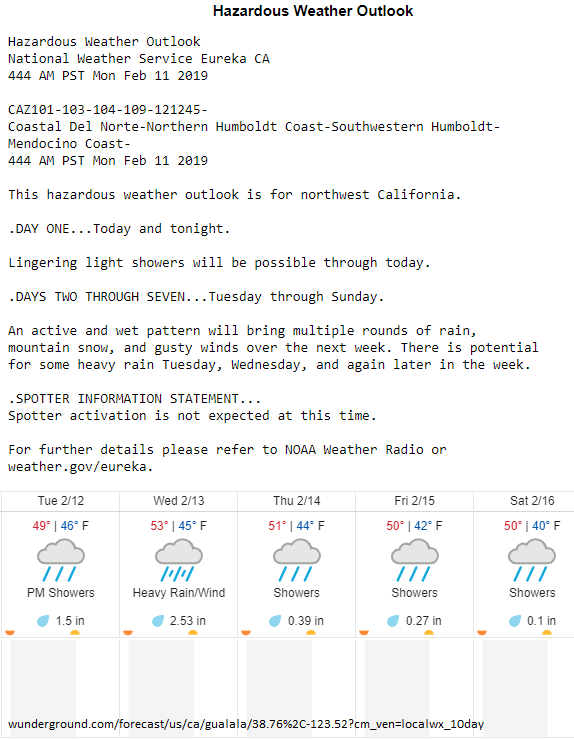 North Gualala Water Company customers can find details on the statewide water use restrictions here. Conservation, News and tagged Voluntary conservation on January 13, 2016 by admin. The North Fork of the Gualala River has swelled over the last couple of days due to the recent rain storms. River flows are now above the bypass requirement of 41 cubic feet per second (see here), which means that the district is back under Voluntary Water Conservation measures. 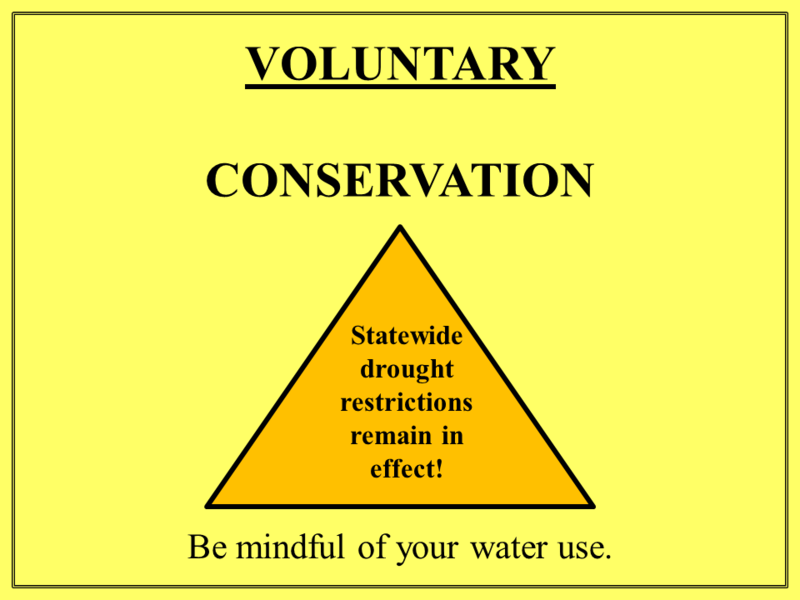 Because of the drought, California statewide water use restrictions are still in place. Customers are being notified of the change by automated phone call on Thursday, January 14, 2016. 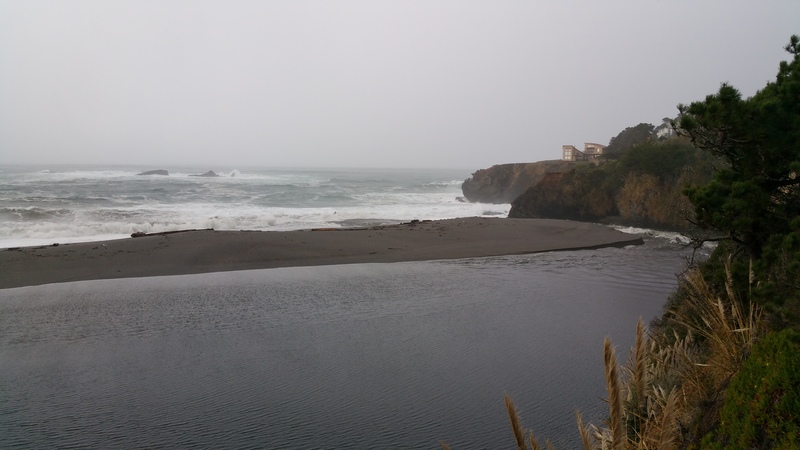 The Gualala River broke through the sandbar on Thursday, December 10, 2015 around noon. It opened at the very north end of the estuary. Conservation, News and tagged Mandatory conservation on July 8, 2015 by admin.